25 | September | 2006 | Through the seasons before us..
Forest of course are still unbeaten away from home this season, following the weekend’s draw at Prenton Park with Tranmere Rovers. However, with two points from the last nine available, we’re hardly sitting pretty on the top of the league at the moment, failing to score in the last three games. Port Vale were keeping us off the top early doors in the season, but have since faltered a bit, losing at home to Bristol City at the weekend, with a poor record of five defeats in their last six league games. They did have a positive interlude of a cup victory over Queens Park Rangers. Grant Holt’s calf injury that saw him start on the bench at saturday apparently hasn’t caused any lingering problem, so will be pushing for a starting place. Commons managed half an hour at the weekend, with no problems so will again have a place in the squad – it’s unlikely he’ll start though, given his lack of match fitness. Port Vale boss Martin Foyle was less than impressed with their performance at the weekend – suggesting he could replace any of his players following a poor second half performance. Despite Vale’s recent collapse, Constantine and Sodje are always dangerous up front, so the defence will need to be on their toes to deal with them – so having Curtis back in the side to give our defence a bit of experience will be a real bonus. Last season we did the double over Port Vale, fingers crossed we can go half way to repeating this feat tomorrow night! 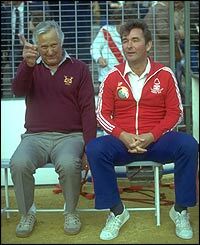 It’s probably fair to say that in life he was often in the shadow of Brian Clough, and the same can certainly be said of him in death – but I think it’s high time the contribution Peter Taylor made to the great history of Nottingham Forest is more readily recognised, certainly by the club itself. When the Executive Stand was renamed the Brian Clough stand, of course only a fool would argue against such an honour being bestowed upon the greatest manager the game has ever seen, I would have preferred the ‘Clough and Taylor’ stand – the stand itself was built in the early 1980’s and is a very real monument to the achievements of both men. The first stand to have coloured seats to spell out the name of the club in the country, and has proven a template for many modern day stadiums until we entered the flat-pack wraparound age. Taylor worked with Clough right from his days at Hartlepool, and indeed met him when both were still players at Middlesbrough. He was a calming influence in the dressing room to Cloughie’s fire, he was a peerless scout and ultimately an essential piece in the Forest jigsaw. I reckon most fans old enough to remember his time here with Clough readily acknowledge his value to the operation, but the club seem to almost deny this due to the acrimonious nature in which Taylor and Clough parted company. 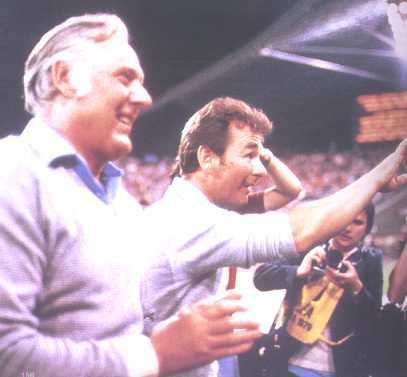 Taylor retired as Clough’s assistant in 1982, only to return to management 6 months later at Derby County, and as if to rub salt into the wounds, he took prize asset John Robertson to Derby from Forest. The aftermath of this resulted in Clough not speaking to Taylor again. Taylor died in 1990 whilst holidaying in Majorca. Clough attended the funeral, and later dedicated his autobiography to him. Whilst Clough did have a secondary great side without Taylor, it’s clear he was never able to reach the heights he did with his second in command alongside him. So when you see the Brian Clough statue in Nottingham once it is in place, spare a thought for his right hand man, without whom I don’t think the great Brian Clough would have been quite as successful. When Forest redevelop the Main Stand (which won’t be for some time, since a precursor for this is being established in the Premiership!) there are tentative plans for a better memorial to Brian Clough, I would urge the club to also suitably acknowledge the contribution of Peter Taylor. I can visualise a statue of them both, perhaps holding a European cup between them, as we’ve seen on so many photographs in our history books, that would be an imposing sight on entering the gates at the City Ground for any team bus coming to face us!